Arsene Wenger: Arsenal fans right to complain, or greedy? Alexis Sanchez's status as the new golden boy of Arsenal was further secured with the late winner against Southampton on Wednesday. The Chilean's 14th goal of an outstanding season since his £32m summer move from Barcelona completed an excellent week for Arsenal and manager Arsene Wenger after a Champions League win against Borussia Dortmund followed by victory at West Bromwich Albion. Arsenal are in the Champions League second phase for the 15th successive season - and could still top Group D if they beat Galatasaray and Dortmund lose to Anderlecht - while victory over Saints lifted them to sixth in the Premier League, two points off the top four. And yet there remains an air of unease and dissatisfaction among some Arsenal fans with 65-year-old Wenger and their team. 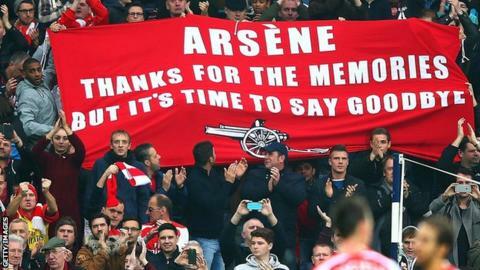 A small group even brandished a banner at the final whistle at The Hawthorns emblazoned with the message: "Arsene - thanks for the memories but it's time to say goodbye." Former chairman Peter Hill-Wood labelled the dissenters "ignorant people". So, are Arsenal's fans right to demand more or are they being too greedy in their desire for success? One FA Cup in the last nine years - won against Hull City at Wembley in May - is a poor return for a club of Arsenal's status and aspirations. The days of "The Invincibles" who went 38 games unbeaten to win the Premier League title in 2003/2004 are but a distant, albeit glorious, memory. In that interim period, despite the move from Highbury to Emirates Stadium and a losing Champions League final against Barcelona in 2006, Arsenal have seen the rise and rise of Chelsea confirmed, Manchester United dominate at home while reaching three Champions League finals, winning against Chelsea in Moscow in 2008, and the emergence of a factor they could not have foreseen. And that has been the rebirth of Manchester City under their Abu Dhabi-based owners, coming out of the shadows to win the title twice, adding insult to injury by helping themselves to a succession of Arsenal players such as Kolo Toure, Emmanuel Adebayor, Samir Nasri and Bacary Sagna in the process. When Robin van Persie decided to leave Arsenal and ended up at fierce rivals Manchester United, playing a key role in their 2012/2013 title win, it will only have increased the frustration of their fans, suggesting they were now strictly second tier. Yes, they have an opulent stadium and great tradition - but the recent past has been short on serious title challenges and they have regressed as Champions League contenders. Arsenal are already 13 points adrift of unbeaten Premier League leaders Chelsea this season so there will be no title challenge this term. Realistic aims will be - again - a top four place and a cup, although it takes an almost unfathomable leap of the imagination to think it will be the Champions League. For a club of Arsenal's tradition, fourth will never become the new first for supporters who may not demand the big trophies be automatically delivered to the trophy room, but certainly expect a more serious challenge for them. It is not an unreasonable demand to want a serious title challenge from a team that has not been in the top two since 2004/2005, although there have been false dawns throughout that spell. Phil Neville, the former Manchester United, Everton and England defender, and now BBC Sport pundit, said: "I don't think Arsenal fans are happy. I think we're starting to see rumbles - they want to start challenging for titles again. "They're not going to win the league this year. Yes, they've qualified for the next round of the Champions League, which is important for the next phase, but they've done that for years anyway. Arsenal fans are demanding more." There is also the loudly-voiced complaint that Wenger has failed to address the two glaring deficiencies that so often undermine Arsenal against quality opposition - a commanding central defender and a midfield powerhouse. Sanchez has been a magnificent signing, but £42m Mesut Ozil looks like a luxury item among so many similar midfield players. There is also a lack of a leader in the mould of Tony Adams - Arsenal have been found out against their closest rivals, such as against Manchester United recently and when they lost 6-0 at Chelsea last season, as well as 5-1 at Liverpool and 6-3 at Manchester City. Until Arsenal can reverse that trend a fan base who were used to victories against that opposition in the early years of the Wenger era will understandably be disgruntled. There is also the lingering feeling that Wenger is too reluctant to dip into the transfer reserves that Arsenal insist are always available, allowing rivals to move even further over the horizon. Former Gunners striker John Hartson says: "I'm sure they would prefer to win more trophies. Just the FA Cup in the last 10 years is not enough. Arsene's argument is 'I bring in £30m every season because we reach the second round of the Champions League'. It's serious money. How much money do you get for winning the FA Cup? £1.5m?" It is in the nature of all football fans to be greedy for success - so why should Arsenal supporters be criticised for it? James Gulleford: I worry that winning an FA Cup last year papered over the cracks. Arsenal fans want a return to prosperity, not a placebo. Paul Andrews: I'm a Chelsea fan but Arsenal should be challenging us for the title and in Europe. A club of their stature should expect better. Will Lack: It is clear that Wenger is from a different age. His ego, arrogance and lack of tactical nous at the highest level means go now. Rian Hoskins: Highest ticket price demands some good games, not mediocrity. We are asking for change, challenge trophies, not fourth place. Mike Webb: Wenger didn't re-sign Cesc Fabregas and Alex Song when given the chance and didn't replace Thomas Vermaelen. Arsenal fans have a right to be angry. The first argument will be - be careful what you wish for. Who is available now who would be a fitting replacement for a manager of the stature of Wenger? Borussia Dortmund's Jurgen Klopp is a favoured candidate among fans after ending the dominance of Bayern Munich and winning the Bundesliga in 2011 and 2012, although his side were beaten by their German rivals in the 2013 Champions League final. Klopp's star, albeit temporarily, is currently on the wane as Borussia lie bottom of the Bundesliga. It may only be a blip but his stock is lower. As Manchester United found out when Sir Alex Ferguson left, it is often difficult to successfully replace a man who has built a club in his own image and likeness, as Wenger has done first at Highbury and then at Emirates Stadium. And, given the riches of clubs such as Chelsea and Manchester City as well as the continued financial power of Manchester United, is there any guarantee a new manager would do any better than Wenger? Former Burnley manager Owen Coyle said on BBC Radio 5 live: "It's all very well for people to want Wenger to leave, but who will Arsenal get in who is better? I'm a great admirer of what he has done but you have to give credit to other clubs for getting better as well." Former England winger and BBC Sport pundit Trevor Sinclair added: "It's not all doom and gloom for Arsenal fans. They obviously do want to start competing in the title race again but I do think there are signs of a bright future with some of the players there." And the shining example is Sanchez, upon who so many hopes - and perhaps even Wenger's long-term future - may rest. There is also the level of consistency Wenger brings to Arsenal, as demonstrated by that ever-presence in the Champions League. The early trophies may have dried up but he has provided the stability and steady stream of finance to such an extent that it helped Arsenal make that seamless transition into their magnificent new stadium. Arsenal are sixth after 14 games and have not been out of the top seven at this stage of the season since 1994/95 - but this has not led to a title since that "Invincibles" year and even the top two has been beyond them since 2004/2005. Wenger, however, has become a guarantee of a cherished top four place. He signed a new three-year contract in May and is bullish when asked about whether they can win the title in that time: "Of course. I think we have what is required to do it." Bold words - but it is clear many Arsenal fans also want bold action and trophies. Sho: Arsenal fans only need to look at Manchester United to see what can happen when a new manger comes in. Careful what you wish for. Jordan: Arsenal could've done the double last year but for injuries. Still won the FA Cup. Plenty would love to be in their position. John Chatham: With all the injuries and money restrictions Wenger has performed miracles so called fans should be careful what they wish for.